It’s mid-morning on Iceland’s east coast, but it might as well be midnight. Fog cloaks the road, blending land, sea and sky into a spectral grey. Now and then, black peaks materialise from the gloom, and slashes in the cloud reveal sudden glimpses of coastline: rocky cliffs, grassy dunes, wild beaches of black sand. Gulls bank and wheel in the wind. 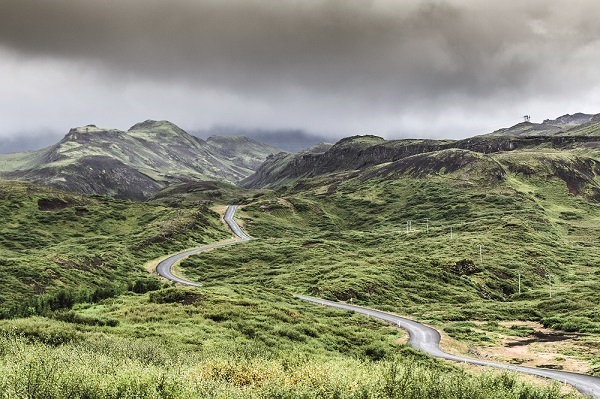 Wild weather is par for the course on Iceland’s Ring Road – or Route 1, as it’s designated on highway maps. Circling around the island’s coastline for 830mi (1336km), the Ring Road is an engineering marvel as well as a national emblem, and this year celebrates four decades of service. 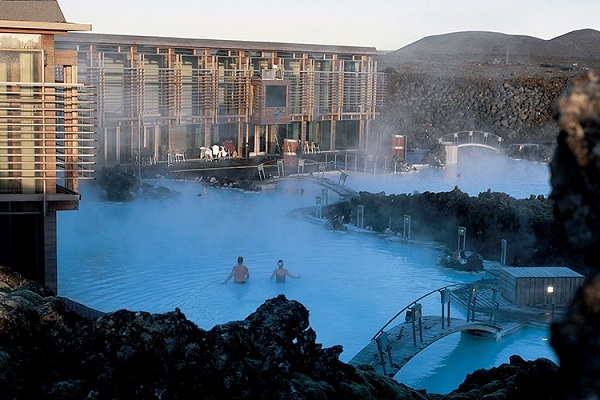 Naturally enough, all distances along Route 1 are measured from Iceland’s capital, Reykjavík. Even here, among the art galleries and pubs, hints of Iceland’s wilder side are easy to find. Looking north across the bay of Faxaflói, a craggy finger of land extends along the horizon, terminating in the snow-capped summit of Snæfellsjökull, used as the setting for Jules Verne’s classic adventure tale Journey to the Centre of the Earth. The volcano remains a brooding presence as the Ring Road heads north from Reykjavík’s suburbs – a reminder that the forces of nature are never far away. Verne wasn’t the first writer to find inspiration among the fjords and valleys of Iceland’s west. To Icelanders, this area is synonymous with the Sagas, the tales that are a cornerstone of Icelandic culture. First written down by historians in the 12th and 13th centuries, but rooted in an older tradition of oral storytelling, these tales of family feuds, doomed heroes, warrior kings and tragic romances are part genealogy, part history, part drama. As the Ring Road swerves inland across the humpbacked hills northwest of Borgarnes, it passes many locations from the sagas: a farmstead that features in Egil’s Saga, a hot spring where the hero of Grettir’s Saga soothed his battle-weary bones. While most of the stories are rooted in fact, many have a fantastical streak that stems from Iceland’s pantheon of myths and legends: strange tales of trolls, giants and dragons, as well as the island’s huldufólk (hidden folk) of gnomes, dwarves, fairies and elves. It’s easy to see how Iceland’s otherworldly landscape inspired such tales. Sculpted and scarred by thousands of years of geological activity, it often appears not altogether of this world. Nowhere is this more true than around Lake Mývatn and Krafla, Iceland’s most volcanically active area. Here, as the Ring Road drops from the uplands, it loops past Goðafoss (Waterfall of the Gods), a deafening mass of foaming white water that seems to emanate from a ragged crack in the Earth’s crust. The cascade is the prelude to an even stranger landscape. 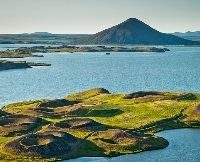 As the Ring Road nears Lake Mývatn’s shoreline, shattered boulders and volcanic pillars litter the sides of the highway, the geological remnants of ancient eruptions. Geysers gush and mud pools bubble. Fissures in the earth spew out columns of steam, a reminder that this part of Iceland sits on top of the Mid-Atlantic Ridge, the unstable meeting point of the Eurasian and North American tectonic plates. As the Ring Road circles around the eastern coast, the landscape becomes wilder and emptier. Isolated villages hunker at the bottom of glacial fjords. Abandoned shepherds’ cabins line the roads. Waterfalls cascade down hills, carving canyons through the rock, including the maelstrom of Dettifoss, Europe’s most powerful fall. The east coast has always been isolated, cut off by distance and geography. Prior to the arrival of the Ring Road, many villages were only accessible via mountain passes, which were often snowbound, forcing the delivery of supplies by air or sea. Reaching these villages was a big challenge for the Ring Road’s engineers, and required tunnels, embankments and bridges to overcome the topography. Iceland’s most epic playground, the Vatnajökull ice cap, covers 3000 sq miles (7770 sq km) of the country’s southeast, making it the largest volume of ice anywhere in Europe. Driving west from Höfn, a small port in one of Iceland’s southeastern fjords, the glacier looms along the skyline, a frozen white sea slicing through a jawbone of dog’s-tooth peaks. As the Ring Road leaves Vatnajökull and cuts west, it enters the flat pastureland of Thingvallavatn, and passes two spectacular waterfalls – Skógafoss, one of Iceland’s highest, with a sheer drop of 60m, and Seljalandsfoss, where the spray refracts the sunlight like a prism, conjuring rainbows from thin air. Bit by bit, countryside gives way to civilisation. Towns and villages become more frequent, and greenhouses appear along the roadside. This is also equine country, home to numerous farms that raise Iceland’s pure-bred horses. Further west, and a short detour north from the Ring Road, lies Thingvellir National Park. A place of wild beauty, it was here that the Vikings established the Althing, an open-air assembly and Iceland’s first parliament. Established in 930 AD, the Althing has a legitimate claim as the world’s oldest form of democratic government, and holds a deep historical and symbolic significance for Icelanders. Appropriately enough, the beginning of Iceland’s recorded history also marks journey’s end for the Ring Road. As it snakes across the magma fields of the Reykjanesfólkvangur nature reserve, it drops down into Reykjavík’s suburbs, bathed under streetlights that seem strange after a week of clear skies and starlight. Far ahead across the bay of Faxaflói, the Snæfellsnes ice cap flashes in the evening light, and the Ring Road begins its circular journey north again – a never-ending thread unspooling beneath a silver sky. • Oliver Berry is a writer and photographer from Cornwall. He has worked for Lonely Planet for more than a decade, covering destinations from Cornwall to the Cook Islands, and has worked on more than 30 guidebooks. Fairly sure that the mountain looming over Reykjavik in that photo is Esja and not Snaefells.